Do you visit websites looking for information only to find a whole lot of rubbish and not much practical information? For example, when I decided to write this post I searched the web for ‘How to lower a1c' and I found articles like this that give you 10 pages of seemingly useless information. For starters those sites where you have to click to the next page to read one paragragh really annoy me. And if I read that post I'd be even more confused! So our goal here at Diabetes Meal Plans is to cut through the crap and confusion and give you practical strategies that REALLY get results. My A1c is high and I need help or suggestions to lower it. I'm feeling so frustrated, please help?! 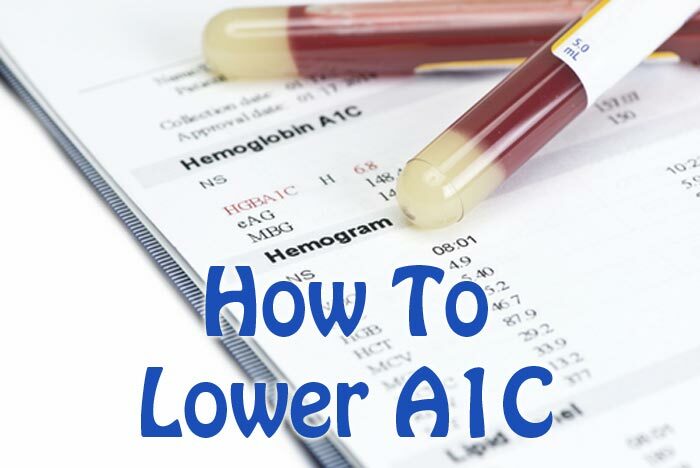 In this post I am going to cover how to reduce a1c but just remember if you have a question, you can submit it over here and we'll answer it in a post. I covered this in detail in another post over here. But the short of it is that A1c is a blood test that is done to reflect your average blood sugar levels over the past 2-3 months. The thing to understand here is what is raising the A1c level, it's sugar/ carbohydrates! A process called glycosylation occurs where sugars (glucose) in your blood stream attach to hemoglobin. The average red blood cell lives for around 3 months, so when they are doing the a1c blood test they are testing glycated hemoglobin. What's affecting this result the most? Sugar/ carbohydrate intake…so that's where you need to start. Essentially you lower your a1c the same as you lower your blood glucose, through diet, exercise, and lifestyle. If it's sugar/ carbs that influence a1c the most, then it makes sense to cut the carbs, right? So one of the best ways to lower a1c is to cut back on the carbohydrate foods you eat by focusing on eating the right type of carbohydrates! You have to cut out the processed and packaged foods because most of it is just junk. The food philosphy we have here at T2DTalk is to eat as natural as you can, eat whole foods that come directly from nature. This is very important because it not only reduces blood sugar levels and a1c, but works on the inflammation and metabolic problems that you have as well. So the result is way better than just trying to reduce carbs. The key is to eat more vegetables, particularly the type of vegetables that grow above the ground, such as cucumber, lettuce, spinach, zucchini, tomato, green beans, brussels sprout, cabbage, asian greens, and the list goes on. Vegetables contain many minerals, vitamins, polyphenols, and compounds that help nourish the body and lower blood sugar, a1c and inflammation. Cutting carbs is not an easy process for most people so often this means you have to start slow. For example: If you drink soda, start there and cut that out. After that you can tackle sugar, and then things like bread, rice, potatoes, and pasta. Basically you've got a 3 month window to change your a1c to a better result, so just take it one step at a time. Exercise regularly – aim for a goal of 30 minutes a day but if you currently do nothing, then start with just 5 or 10 minutes and build up from there. Drink water – you need to drink plenty of water with diabetes, aim for at least 1.5 liters per day. Live a healthy lifestyle – lowering a1c levels does take some commitment so this must come from within, a mindset change where you really put yourself a a priority, resist temptation, and focus on permanent changes. Keep a food diary – this will help you truly monitor what you eat, when you eat, and how you are feeling. Keep a cap on stress – stress bumps up blood sugars so don't stress about your levels or anything else. Work in your circle of influence, meaning focus on what you CAN do and change, don't focus on or worry about what you can't change. Test, test, test – you need to test regularly so that you can see how foods, life, and other things affect your blood sugar levels. Test before an after meals. If you do eat carbs, test before and after so you can actually see how they affect your blood sugar levels. Now if this all seems too much, the only thing you need to focus on right now is cutting back the carbs! This in itself will result in dramatic changes. Need help to know what foods to eat and cut the carbs? You might like our 30 Day Turnaround Program it helps you make the cut gradually with lots of alternatives and food ideas. I have T2. I’ve been eating veggies, lentals, protein and drinking mostly water and my numbers all day are staying at 300. Why? Don’t get frustrated Cara, you’ve come to the right place! Start by ditching the lentils for the time being, lentils are packed with nutrients but can also be a little too high in carbs for some people. Once your sugar is under control you can try reintroducing them in small amounts. Take a look at this food list and make sure you’re eating these types of foods. Are you on any medication? For some people, even after following a low carb diet, your body may need a little extra help via medication. Speak with your doctor about either adjusting your current meds, or getting started on something to bring your sugar into a healthier range. Other common factors that increase sugar levels are infection/ fighting a cold, stress, frequent alcohol consumption or lack of sleep. If any of those apply to you make sure to get that in check as soon as possible! Im wondering if smoothies of veggies are good to get ur A1C down or stick to veggies being consumed whole ? Yes- veggie smoothies can be a good option for lowering A1c. By choosing veggies over fruit, you are lowering the sugar content of your drink. Add some protein and a healthy fat and you are good to go! Here is a recipe for a Green Superfood Smoothie you might enjoy. We still encourage you to consume plenty of (raw) whole vegetables throughout the day as well. I came across your post, so informative so thank u for all the tips. I was diagnosed in January 20017 with type 2. My AC1 was 7.9 . I was petrified when my doctor send me to a vision test to see if the diabetes’s were affecting my eyes. Thank god it didn’t. But that was my rock bottom. I went from 220 to 196pounds in 6months and my AC1 dropped to 5.6.i did amazing with the diet. I am currently on metforming and I need to drop another 30 pounds but it’s hard to be so discipline and diabetes is all about that. I need to go back on track and keep this awful disease under control. I am looking for a meal plan sample so I can follow. Here is a two-day sample meal plan to get you started, you might also be glad to know that we offer memberships for weekly meal plans that may be just what you need to stay on track. The best news is that a low carb diet is also a great diet for weight loss so it will help you achieve both goals of better diabetes control and a healthy weight! I think there is a great chance that if you cut out the foods you mentioned above, and adhere to a low carb diet (we recommend under 130 grams/ day), that you will return to your level of control that you previously had. Here’s an article that Jedha just published that might be a good refresher for getting your diet back on track. Hi Ron, check out this article about bread and bread alternatives. The good news is that there are some acceptable products out there, just make sure you are still filling your plate with plenty of non-starchy vegetables, protein, and healthy fats to get the best results. I have been struggling with my A1C for about 2 years now.. last it was checked was over the summer and it was at 6.3, I am scared to check again since I already workout 6-7 days per week (30min per day) and hardly eat carbs! I don’t know what else to do to lower my numbers. Your levels are pretty close to the normal range Denise (4-6%). What about considering other factors – stress, sleep, hormones, etc? These also play an important role. My A1c level was 14.2 in July of 2017. I was put on insulin of 25 units for each night. I eventually wanted to get whan off of insulin and I did 26 days later. In August my a1c level was 10. Just took A1c test oct4 and it is 5.9 all my research and hard work and praying for directions really paid off. I was ask how and even that it’s impossible but numbers don’t lie. It don’t stop to there. Does A1C have any connection to hemoglobin count? I am less on hemoglobin (10.2) and my A1C is 6.5. Would A1C get any better if I try to fix my iron deficiency? I’m not 100% sure about this so check with your doctor but my guess would be no. A1C is a measure of glucose attached to hemoglobin, so though they are in a way connected, they are two completely different tests overall. Improving A1C largely comes down to diet and lifestyle. I did let the Dr. order an A1C test and will be interested to see how the payment issue plays out. Since no one called me with the result I called them as it is important to me. In December A1C was 9.3. In mid April it was 7.2. From my point of view the improvement is significant and very encouraging. From the nurses viewpoint it is not as good as they would like it. Go figure! Eating whole foods and moderate exercise does make a difference! A 2.1% drop is HUGE Jim, congratulations. If I were them I would be applauding you for your efforts and be curious as to how, because in our experience majority of patients don’t achieve such a significant drop. Best of all, you know what you’re doing is working, so keep on going and the A1c will only improve. Congrats again! You’re welcome and good luck. We look forward to hearing your reports Helen. Hi Chuck, A1c is a reflection of glucose in the blood over an average 3 month period – this is the lifespan of a red blood cell. That is why the doctor has given you 3 months, because it generally takes 3 months to see a change. A1c is not usually tested more frequently than this because of this reason. Your main focus to get a lower number is to lower your carbohydrate intake as it’s the glucose/ carbs that attach to the hemoglobin in red blood cells. And of course, the exercise helps improve your insulin sensitivity so your body reacts better to foods you eat and can clear glucose from the bloodstream more efficiently. But really focus on those carbs and you’re bound to see the result your doctor wants. If you don’t know how to lower carbs or even what ones are best to eat, I’d recommend you join our 30 Day Program or become a VIP member where we have a full carb course, along with meal plans and ample low carb recipes to help. One of the things that has confused me since being diagnosed Type2 is blood sugar and A1C. With insufficient explanation out of the gate it was easy to think there were 2 different things. As I understand it, blood glucose readings are instantaneous and A1C is an average of the same thing. For those of us in the trenches it seems to me focusing on the daily readings makes sense because we can affect those immediately (good or bad). It annoys me to be asked what my A1C is because I only know what it was at some past date. Next week I see my PCP and he will want to know A1C. Now I understand that Medicare won’t approve it since it hasn’t been 6 months. I’m thinking about purchasing an A1C test kit so I can determine it myself. I doubt the Dr. will like it since I did it myself but the only thing I dislike more than Drs. is dealing with insurance companies. Yes Jim, you’re correct, they are the same thing – in a way. I’m hearing you – insurance companies are often a nightmare! You can go to pathology and pay for the blood test yourself as well, that would likely be better than conducting the test yourself. My doctor also runs the test in his office if he wants it sooner. It is just included in the office visit since I am also on Medicare. Start here Joyce, you’ll find lots of helpful info to put you on the right track. my number is 254.. just discovered. Well Doug, it’s not such great news but the good thing is it’s never too late to make changes and you’re still young! my number is 254, which is great concern, I am 6.0ft tall, 174lbs, 66 years old and have a thickening left ventrical wall. Thanks for posting all these articles. It helps alot. I have heard cinnamon helps lowering your blood sugar as well. Is this true? If so, what do you recommend amount of daily intake and how to take it? Cold, room temp, or hot tea? I am having most trouble with fasting blood sugar. I am not taking medicine yet and I do not want to do so. The other day my blood sugar was 87 before bed time. Then in the morning it was 140! How can I lower that morning blood sugar. I too have that problem. I have been checking my blood and keeping log. For me, it is high in the evening and lowers about 20 in the morning. If I check my levels in the day for instance before lunch I am in within the normal range, in the 90’s. Before dinner highest I seen was 107. This is with me not being in any time of medication. Is this the beginning of being full diabetic or am I basically a diabetic that only meds can control it?